The Multi-Drug Rapid Test Cassette is a rapid urine screening test that can be performed without the use of an instrument. The test utilizes monoclonal antibodies to selectively detect elevated levels of specific drugs in urine. During testing, a urine specimen migrates upward by capillary action. A drug, if present in the urine specimen below its cut-off concentration, will not saturate the binding sites of its specific antibody. The antibody will then react with the drug-protein conjugate and a visible colored line will show up in the test region of the specific drug cassette. The presence of drug above the cut-off concentration will saturate all the binding sites of the antibody. Therefore, the colored line will not form in the test region. A drug-positive urine specimen will not generate a colored line in the specific test region of the cassette because of drug competition, while a drug-negative urine specimen will generate a line in the test region because of the absence of drug competition. Each test line contains anti-drug mouse monoclonal antibody and corresponding drug-protein conjugates. The control line contains goat anti-rabbit IgG polyclonal antibodies and rabbit IgG. 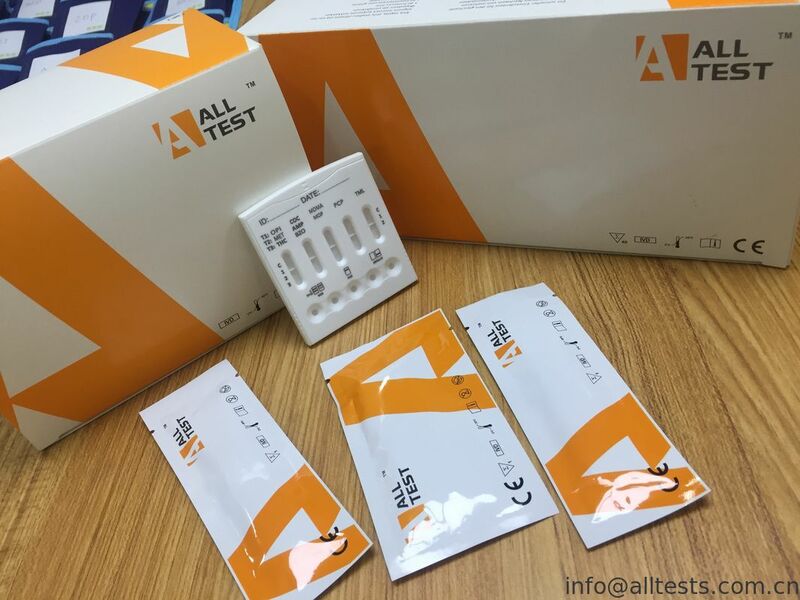 Configurations of the Multi-Drug Rapid Test Cassette come with any combination of the above listed drug analytes. This assay provides only a preliminary analytical test result. A more specific alternate chemical method must be used in order to obtain a confirmed analytical result. Gas chromatography/mass spectrometry (GC/MS) is the preferred confirmatory method. Clinical consideration and professional judgment should be applied to any drug of abuse test result, particularly when preliminary positive results are indicated.